The gift of God's forgiveness is received through private prayer, corporate worship, and the disciplines of prayer and fasting, penitential services and above all through the sacrament of Holy Confession. The value of Holy Confession is twofold. First, through this sacramental act of the ordained priest and the Christian believer we have the assurance of divine forgiveness, according to the words of Christ (John 20:23). Secondly, Holy Confession provides the opportunity to talk about one's deep concerns, to receive counsel and to be encouraged toward spiritual growth, all of which are universally recognized as extremely beneficial to personal life. 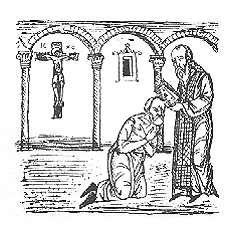 Holy Confession is appropriate whenever an Orthodox Christian feels the need for it. Please call on our office to make arrangement with Father Konstantinos Douvikas. Information to contact us is just a click away on your right hand side of this page. How can one prepare for Holy Confession? Preparation for Holy Confession is a prayerful examination of feelings, thoughts, words, acts, attitudes, habits, values, priorities, goals, direction and way of life. 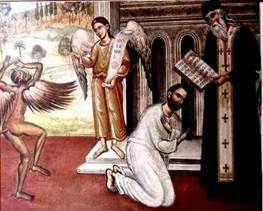 This prayerful self-examination includes not only the personal religious life, but also family relationships, social activities, job conduct, business dealings, political commitments and even recreational pursuits, because our entire existence should be lived in under the light of the Holy Spirit is not to condemn ourselves, but to affirm our true selves in Christ who has given us access to God's mercy and forgiveness and who has taught us to live for God's glory. Now, without justification or self-pity, make a prayerful examination of your conscience regarding all things. As a help, reflect on your life in the light of the Ten Commandments and the Beatitudes. Take pencil and paper and specify your sins so that, at the time of the sacrament, you will be able to make a thorough confession from the list, without confusion or lapse of memory. Has God been the source, center and hope of my life? Have I put myself, others or things before God? Have I failed to trust in God's existence, love and mercy? Have I failed to pray to God, to worship Him and to thank Him for His blessings? Have I tried to serve God and keep His commandments faithfully? Have I murmured or complained against God in adversity? Have I praised and glorified God through my words and deeds? Have I valued anyone or anything above God? Have I given to anyone or anything the love, honor and worship that belong to God alone? Have I made and idol of any person, idea, occupation, or thing? Have I blasphemed God's holy name in any way? Have I sworn a false oath? Have I broken any solemn vow or promise? Have I entered into an agreement, promise or contract against God's law? Have I cursed or used foul language? Have I worshiped regularly on Sundays and major feast days and have I helped others to do the same? Have I worked unnecessarily on Sundays or major feast days or caused others to do so? Have I spent the Lord's Day in a wholesome and edifying ways? Have I caused the harm, injury or death of anyone? Have I wished my own or anyone's harm or death? Have I been cruel to animals or destroyed any life unnecessarily? Have I truly yearned for God's will to be done in all things? Have I worked for justice in my family, society and the world in ways with in my reach? Have I tried to cultivate a righteous life through prayer, fasting, worship, receiving Holy Communion and deeds of love toward others? Do I have God's peace in my heart? Have I been unfairly angry, aggressive or impatient? Have I worked for peace at home, work, Church and in society? Have I been irritable, polemical, or divisive? Have I complained when persecuted for God's sake? Have I prayed for my persecutors? Have I failed to defend anyone in the truth for fear of humiliation or persecution? Have I had the courage to stand up for what is right despite criticism, ridicule or persecution? Is the joy of Christ in my heart even in trying moments? Have I been pessimistic despondent or despairing? Have I truly delighted in the promise of God's treasures in heaven? Lord, if I have sinned in word or deed, in mind or spirit, forgives me. This prayer is a classic prayer of repentance attributed by tradition to Manasseh, a wicked king of Judah (2 Chr 33:11-13), who pleaded God's forgiveness for his many sins.